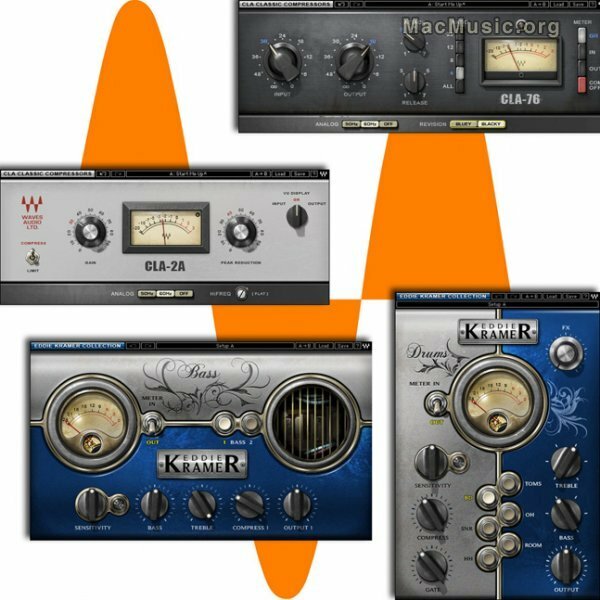 Waves Audio continues its Waves Artists Collaborations with the release of two new bundles plus two new plug-ins: The Chris Lord-Alge Artist Signature Collection and The Jack Joseph Puig Artist Signature Collection, both part of the Waves Signature Series, and Eddie Kramer HLS Channel and Eddie Kramer PIE Compressor, from the Waves Modeling line. The Waves Signature Series features customized multi-effects plug-ins (with compression, EQ, reverb and more) based on the personal processing chains and settings of top producers and engineers. The Waves Modeling line consists of software plug-ins based on vintage and rare hardware, such as SSL, API, and Neve mixing console components. . Following closely on the heels of the Waves Modeling CLA Classic Compressors, Waves Signature Series presents The Chris Lord-Alge Artist Signature Collection. These six application-specific plug-ins (CLA Bass, CLA Drums, CLA Vocals, CLA Guitars, CLA Effects and CLA Unplugged) are the result of close collaboration between GRAMMY® Award-winning mixing engineer Lord-Alge and the Waves R&D team. With a mixing career spanning almost three decades, Chris Lord-Alge has worked alongside such artists as Green Day, U2, Creed, Snow Patrol, Daughtry, Nickelback, Jimmy Eat World, Santana, and many others. Created from CLA's custom processing chains, this collection gives users instant access to Chris Lord-Alge's signature sound: radio-ready rock with an edge. The Chris Lord-Alge Artist Signature Collection is Native only and has an MSRP of $800. Over the past three decades, JJP has helped redefine the role of the producer/mixing engineer, working with such acts as John Mayer, Black Eyed Peas, No Doubt, Panic at the Disco, Weezer, Goo Goo Dolls, the Pussycat Dolls and many more. Following the successful JJP Collection, which modeled rare pieces of vintage gear from his personal arsenal, Waves Signature Series introduces the Jack Joseph Puig Artist Signature Collection. Developed in close association with JJP himself, these six application-specific plug-ins (JJP Bass, JJP Strings & Keys, JJP Drums, JJP Vocals, JJP Guitars and JJP Cymbals & Percussion) were created from JJP's personal processing chains and give users immediate access to Puig's larger-than-life pop/rock sound. The Jack Joseph Puig Artist Signature Collection is Native only and has an MSRP of $800. Both the new Chris Lord-Alge and the Jack Joseph Puig Artist Signature Collections are part of the Waves Signature Series. The Waves Signature Series is Waves' exclusive line of application-specific audio processors, created in collaboration with the world's top producers, engineers, and mixing engineers. Each and every Signature Series plug-in has been precision-crafted to capture the artist's distinct sound and production style, using custom multi-effect processing chains designed by the artists themselves. Over the course of a production and engineering career that spans more than four decades, Eddie Kramer was the man behind the board for some of the biggest names in music history, including Jimi Hendrix, Led Zeppelin, Kiss, The Beatles, David Bowie and many more. Continuing a fruitful partnership that recently resulted in Waves Signature Series' Eddie Kramer Collection, Waves announces the latest in its Modeling line: the Eddie Kramer HLS Channel and the Eddie Kramer PIE Compressor. Created in collaboration with Kramer himself, these meticulously modeled plug-ins are based on the vintage gear he used in historic sessions by such acts as Jimi Hendrix and Led Zeppelin at London's acclaimed Olympic Studios. The HLS Channel Strip was modeled on the Helios recording console from the Rolling Stones' mobile truck (and which was immortalized in Deep Purple's "Smoke on the Water.") The PIE Compressor was modeled on the vintage Pye compressor, which was a mainstay in high-end British studios during the 60s & 70s. The Eddie Kramer HLS Channel and the Eddie Kramer PIE Compressor are Native and TDM.